This amazing photograph clearly shows the face of a bearded man with a leaf crown or headband. 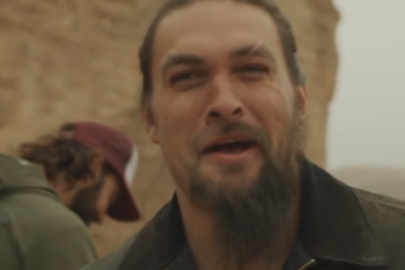 Does this face resemble that of the old wise man of Greece? Zeus? Or Poseidon? The mystery deepens as you can see another face behind the ear that appears to be looking in another direction and possibly additional faces farther to the right and a large one in the middle of the picture. 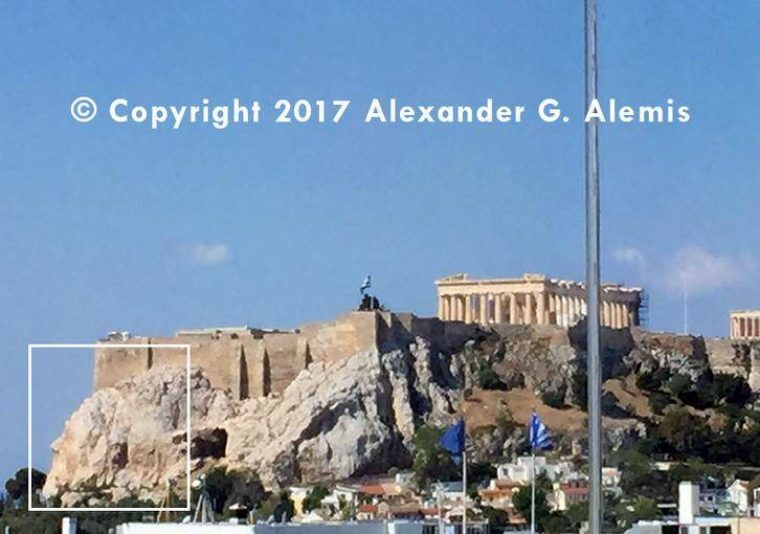 In April 2017, Dr. Alexander G. Alemis went to Athens, Greece, to present his new book, Political Systems and their Relationship to the Economy and Freedom. One of Dr. Alemis’ many interests is photography. He likes taking unique photographs as he sees things from different angles. 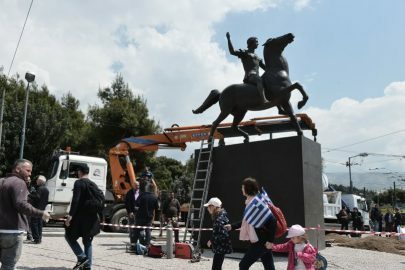 This photo though, which he took in Athens on April 23, 2017, is incredibly special. 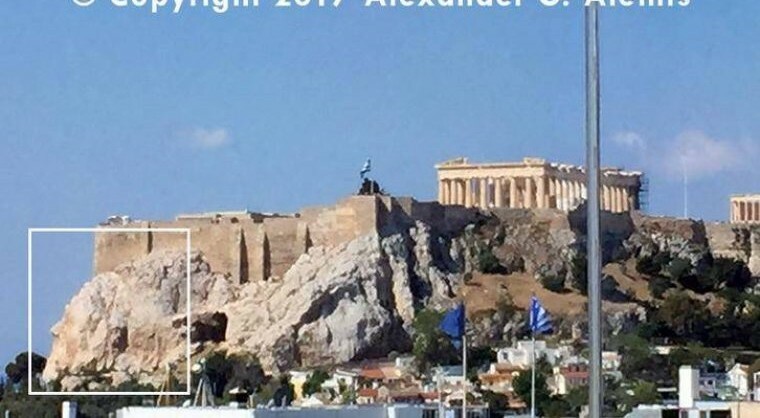 He took a picture of the Acropolis Rock from a certain spot which revealed the faces in the rock formation for possibly the first time in history. At Dr. Alemis’ request, I researched the Internet for anything relating to the face of the Acropolis and found nothing. Subsequently, we put it on Facebook, but besides the accolades and admiration for the picture, we received no evidence of this face or faces being known. Dr. Alemis talked to two archeologists in Greece who have done extensive study of the Acropolis and its history but had never seen or read about the faces of the Acropolis. But how is this possible that for 2,500 years no one has discovered these faces? When Dr. Alemis first showed me this picture and asked me to send it for copyright I thought he was pulling my leg. As he showed me the rest of the pictures and the vantage point from where he took this picture from, I was shocked. 1. That it was not discovered, documented nor studied all these years. Keep in mind, the Acropolis is probably the most photographed monument in the world. 2. How Dr. Alemis discovered it: He told me approximately 20 things had to happen for him to be there that morning on April 23rd. 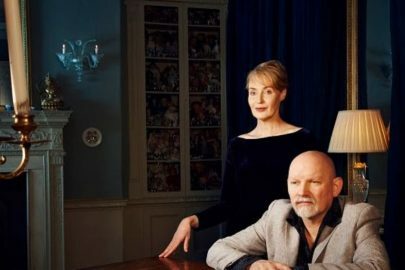 None of those events were planned, including the incident where one of his staff decided to switch seats with Dr. Alemis during brunch that morning, which caused him to see the face on the rock. 4. Who could have carved this huge face on the rock at the exact corner of the Acropolis? 5. What equipment did they use? 6. Was the face or faces carved prior or after the Parthenon? If prior, what other faces were also carved, which have already been destroyed, and for what purpose? 7. If the faces were carved prior to the Parthenon, what technology was used and is the Parthenon a lesser monument? In as such, this finding has the possibility of changing history. Dr. Alemis will be going back to Greece this fall to present his new book The 63 Parts of Intelligence and will get more data about this view, but if any readers of The National Herald have any information about the face or faces of the Acropolis, please email: marketing@familydentalcare.com. Dr. Alemis is the founder of the Family Dental Care group. He is an international speaker and writer. You can visit him at www.dralemis.com. ← Are gender feminists and transgender activists undermining science?